Obtaining estimates of density or abundance for large carnivores that are rare, elusive, and inhabit remote wildlands has been a long standing challenge for scientists. 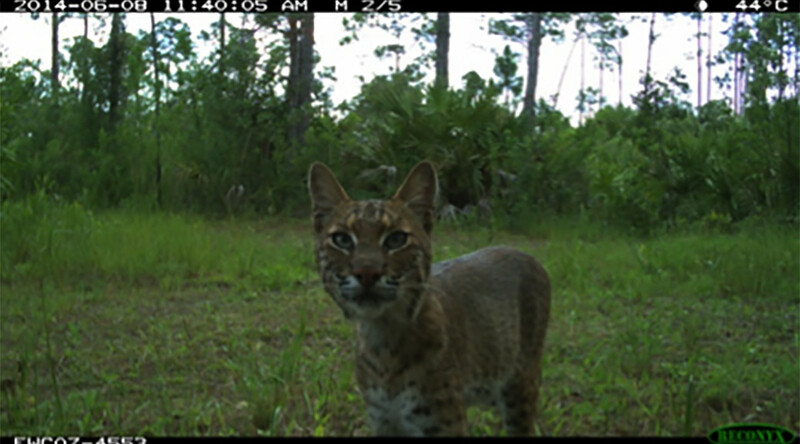 The FWC Panther Research Team, along with collaborators at the National Park Service and Conservancy of Southwest Florida, initiated a study in 2014 to estimate the density of Florida panthers in a 162 km2 section of the Big Cypress National Preserve north of I-75 (Alligator Alley). Fifty passive infrared motion detecting cameras were deployed within a standardized grid across the study area from April to September 2014 to capture photographs of both marked (radiocollared) and unmarked panthers. Cameras collected five photos in rapid succession when triggered by motion. 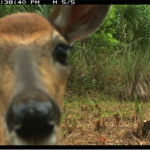 During the study period, 88,534 photos of wildlife were recorded. The majority of photos were white-tailed deer and Osceola wild turkey. 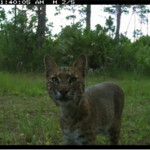 Other species documented included river otters, feral hogs, Florida black bears, bobcats, coyotes, alligators, several species of birds, insects, herps, and panthers. Individual panthers are not reliably identifiable by their fur, unlike spotted or striped felids, hence our reliance on having a portion of the population marked. In order to estimate density, photographs of marked and unmarked panthers will be analyzed within a spatial mark-resight (SMR) model that is based upon the framework of traditional mark-recapture analyses. The SMR model utilizes the spatial component of marked panther encounter histories at known locations (camera sites) across the study area, counts of unmarked panthers at camera sites, and radio telemetry data from marked panthers using the study area, to derive a density estimate. Results should help direct future research projects that utilize this study design to derive population densities across multiple study areas in order to obtain a range-wide population estimate for panthers with acceptable levels of precision. 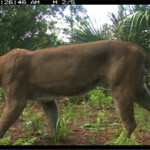 Such estimates play a critical role in determining progress towards achieving recovery criteria established for the endangered Florida panther.